Let me preface this post by saying these shots are raw...not staged and you may even spy some dust! But...here goes, keeping it real. I've been working on turning my dining room into a library, of sorts. I want to create a space for my girls to use for school. Being that they are now in 8th and 11th grade (AND a senior in college), I need something more than a playroom and still keep it usable for serving meals during the holidays. The answer is a library with a large table. The dining room has a cathedral ceiling so there's a lot of wall space to cover. In the past, the largest wall has been blocked by my huge armoire used for a craft cabinet for my altered art supplies. You can see it was massive and messy! It looked so much smaller in the store. Well, thanks to Craigslist and a young nurse needing "bulkier" furniture for her newly purchased, first home, it's gone. 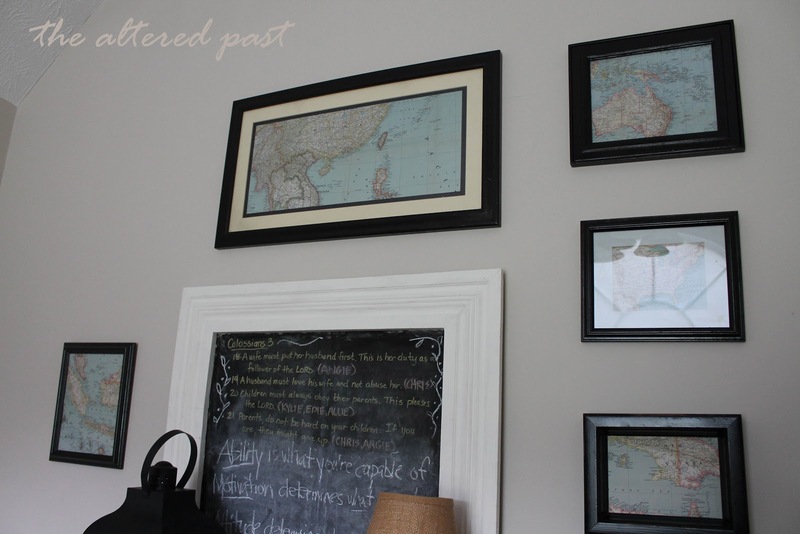 It's being replaced by this...the beginnings of my gallery wall of vintage maps for the library. The large chalkboard was a yard sale find y-e-a-r-s ago. It was painted bright yellow with hot pink cardboard covering the tin. For $5, I brought it home and peeled the brittle cardboard out of the center and found that it was lined with 1950s newspaper pieces. I finally made it to the bottom layer and revealed the tin backing. I painted it with flat black. I didn't know about DIY chalkboard paint back then. It has hung in several places in our home since then and has served many purposes. Well, this is the beginning of my gallery wall. I'll keep you updated on the progress of my library. For now, here's a sneak peek at the other wall. I hope you're beginning to experience Fall where you are. It's beautiful here in Tennessee. Thanks for stopping by and God bless! I link to these parties. Be sure to check them out! 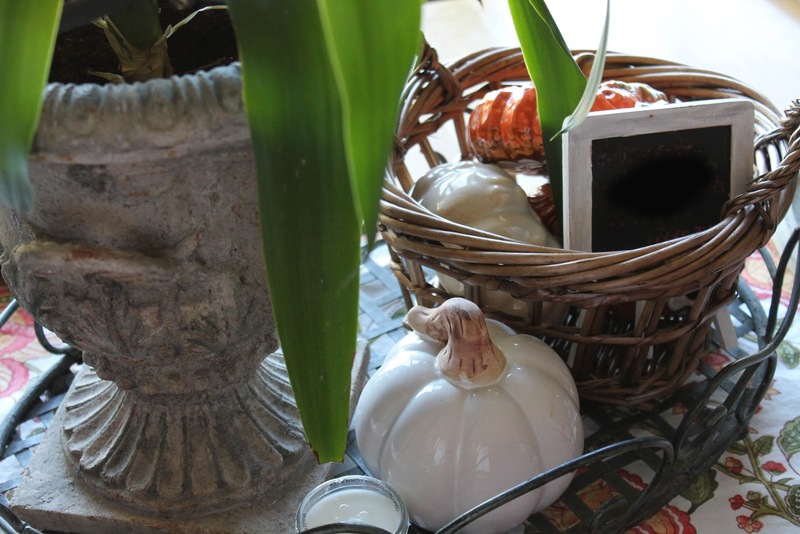 Last night, Rhoda of Southern Hospitality led a Twitter chat sponsored by Wayfair. It was so much fun and high energy to say the least. There were several bloggers there and lots of great tips. The discussion was thrift store and yard sale shopping. You wouldn't believe some of the great bargains that were shared. I've shared a few of my finds in earlier posts. Most recently, I shared my gilt mirror that I purchased for $11, not at a yard sale or thrift store but through an online estate auction. Another deal I scored through an online estate auction is this alabaster lamp. My winning bid was $9! Did you know that auction companies are now using online formats for estate and personal property auctions? Well, they do and it's awesome. I've attended many auctions over the years but I've missed even more because of other commitments or bad weather. Not any more! Most online auctions are open to bidding for about 3 weeks with a preview date a week before the auction closes. It's always good to see the items firsthand before placing that final bid. There is one thing to consider when bidding...items are sold as "pick up only." Very few auction companies offer shipping. You need to take that into consideration and bid on items within a reasonable driving distance. If you're in the Tennessee area, you can check out Comas Montgomery's auctions. They list auctions statewide. I've purchased from them many times and they're great to deal with. Check your area auction companies to see if they're on board with this new format. You'll be glad you did. Yard sales are always a great place to find bargains. One man's junk is another man's treasure! This past year I found a great set of bamboo chairs for a steal, $30. You can read about them here. I still haven't recovered the cushions and I'm pretty sure I won't be painting them any time soon. I'm going to have to grow tired of the patina on the natural bamboo before I do. One last find I want to share is from an area thrift store, All Things Possible - Bargain Center. I love this store. It can sometimes be smelly and you'll definitely grab the hand sanitizer when you leave but they have some GREAT deals. I found this beautiful cabinet for my kitchen. I posted about it here. Not that I haven't gotten some good deals at my local Goodwill but I find that locally owned thrift stores seem to have better prices and sometimes better deals like frequent buyer cards or specific sales for different departments. The cabinet was priced at $29.99 but it just happened that furniture was 75% off that day. I ended up paying $7.50 plus tax! 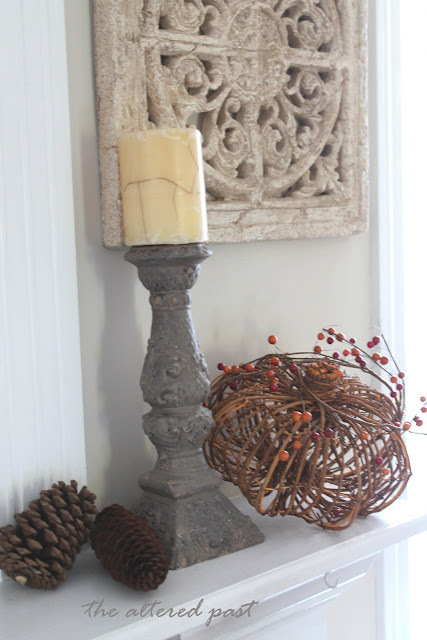 It doesn't take a lot of money to make your home look beautiful with quality pieces. But, it does take some time. I like the thrill of the hunt so I guess the time doesn't bother me. 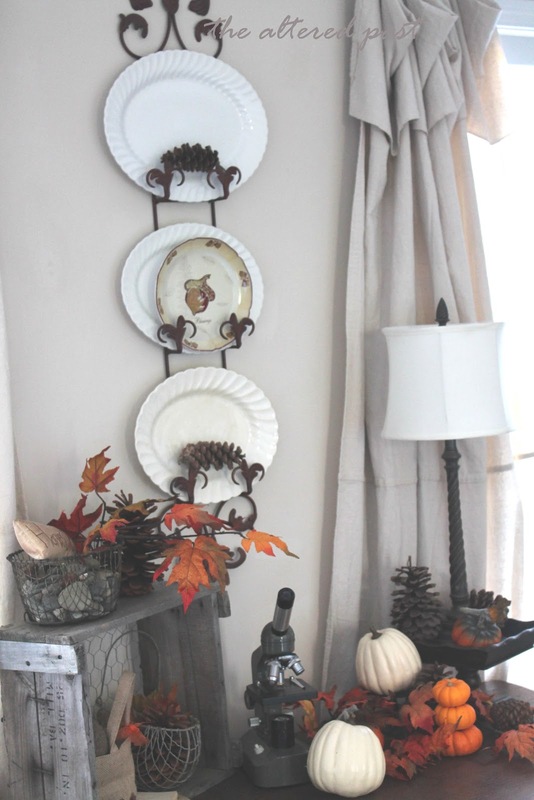 My house will never be finished either because I'm continually decorating and re-decorating. Don't you? By the way, during last night's Twitter chat, Wayfair was giving away $25 gift cards every 10 minutes. Well, yours truly won one. I never win giveaways! Dare I confess that I've already spent the gift card, lol! My order should be arriving soon and I'll be sure to share. Thanks for spending some time with me. God bless! 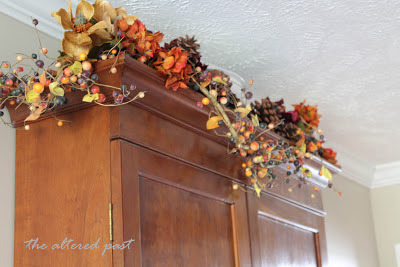 I was finally able to get the fall decorations from around the house posted. I think you may notice some improvements in the photos in this post. Instead of opting for the quick and convenient camera on my iPhone, I borrowed my daughter's Canon Rebel. Wow! What a difference. 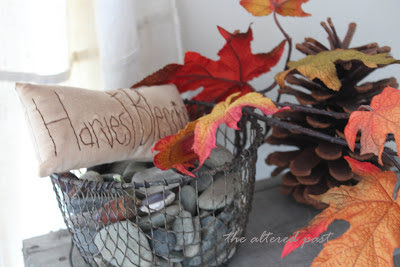 Certainly worth the extra time it takes to download, watermark, and then upload to my blog. There are a lot of pictures so you may want to grab a cup of coffee and a seat. I'll try to keep the commenting to a minimum since there are so many. 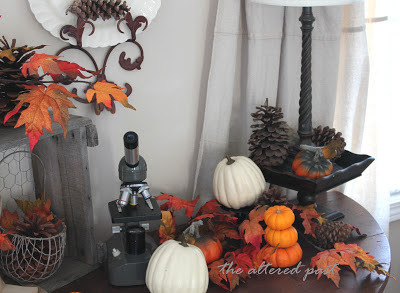 I hope you enjoy taking a small tour of my home decorated for fall. 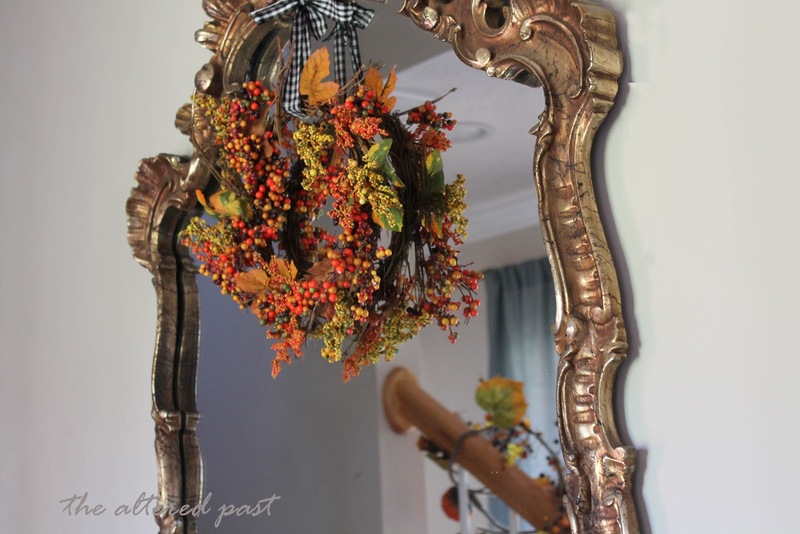 This beautiful gilded mirror was an auction score for...wait for it...$11! Are people just not looking or what? It's very old and very heavy! 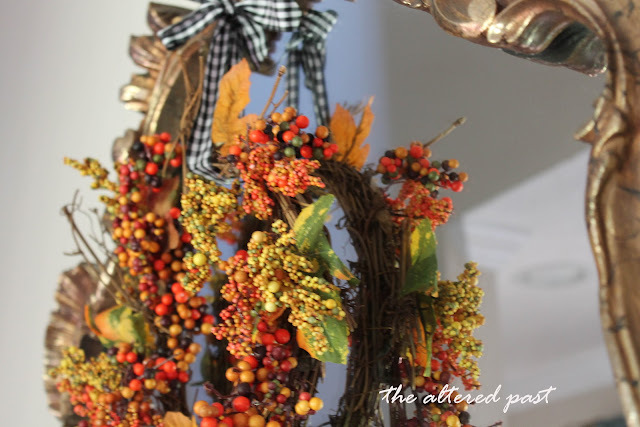 I added the small wreath with a black and white gingham ribbon. This is a grouping of pumpkins, pinecones, leaves, and acorns...both real and, uh, fake faux. The half moon (as my grandfather called it) table came from my mom's parents. Yes, that's a vintage school microscope. I thought it looked at home among the leaves, acorns, and other items from nature. 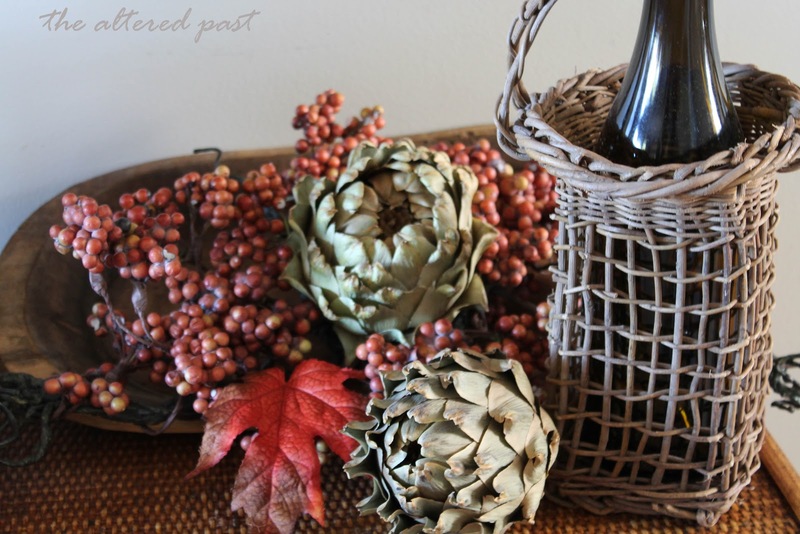 An old strainer turned basket for found items. I have also used it as a cloche with a starfish during the summer. I grew up in the foothills of the Smoky Mountains so I have a thing for river rocks. An old crock filled with daisy mums from my sweet sister. They were an anniversary present from her this past weekend. 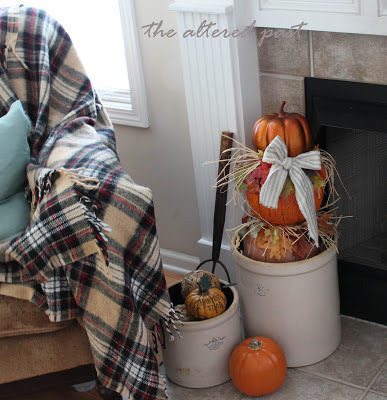 The crock sits under the half moon table. Another shot of the table with ironstone platters in the rack above. This vignette sits on the hearth near our fireplace. More crocks! The pumpkin topiary in the larger crock was made using the $1 plastic jack-o-lanterns and a $2.50 metallic pumpkin from Target. Super easy and more on it later. The pitchfork (barely visible behind the crocks) was actually used by my grandfather many, many years ago. I love having pieces with family history. The crocks were, believe it or not, Goodwill finds for $4.99 and $7.99! I happen to be one of those poor souls with the huge black hole (tv alcove?) above the fireplace. Therefore, I only took a picture of the side of the mantel. 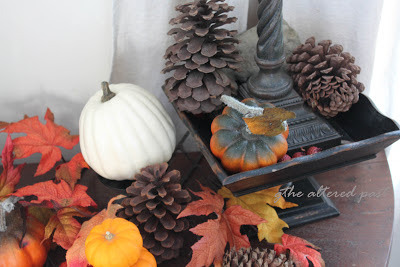 A grapevine pumpkin and pinecones are simple and I love the natural colors against the white. The top of the antique cabinet I purchased at the local thrift store has been crowned with a garland of berries, pinecones, hydrangeas, and an ironstone tureen. 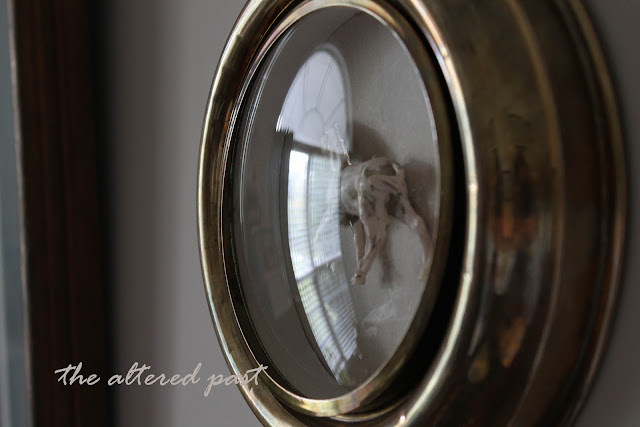 You can read about the purchase of the cabinet here. 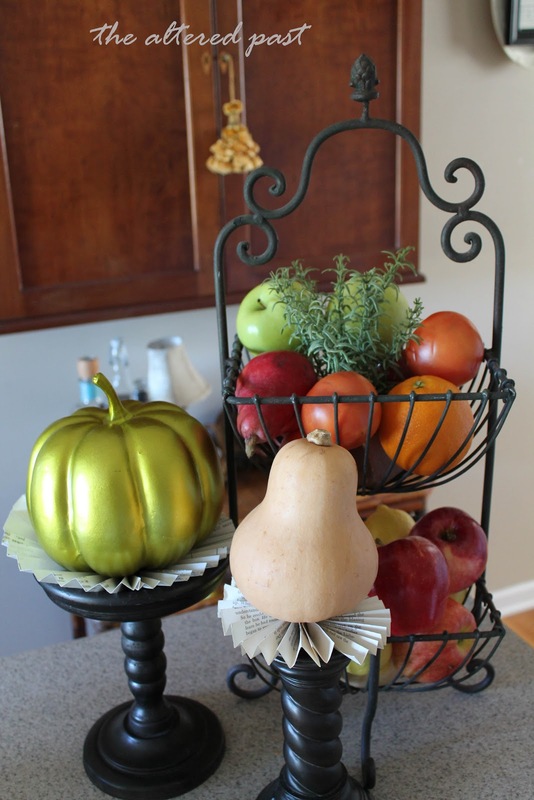 Another metallic pumpkin from Target and a butternut squash on the kitchen island. 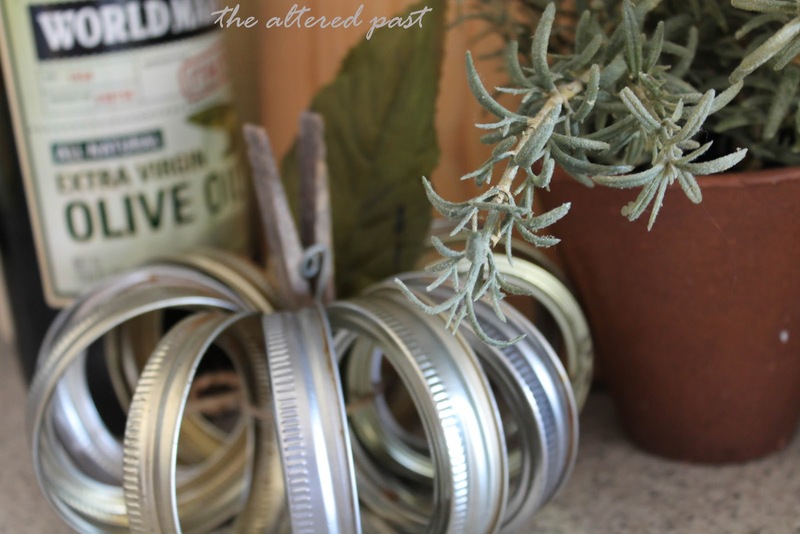 The old dough bowl, berry spray, and dried artichokes sit on the bamboo table below the antique cabinet in the kitchen. 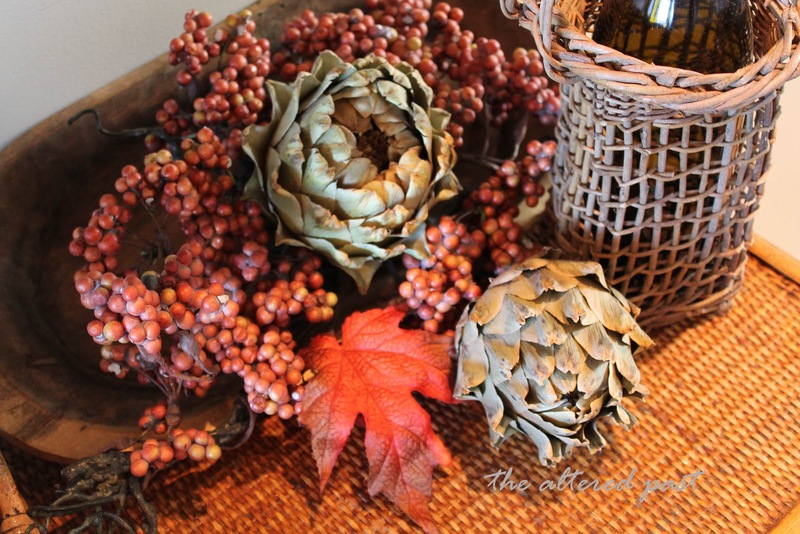 Dried artichokes are a beautiful yet cheap fall addition. I purchased these at the grocery store about a month ago for $.68 each. I just kept them on the counter until they were completely dried. You don't have to do a thing to them! This is probably cheaper than buying artificial artichokes from the craft store! And, lastly, I wish I could take credit for this adorable idea but I can't. I found it on Pinterest. The pumpkin is simply a group of canning lids (wish mine were more rusty!). 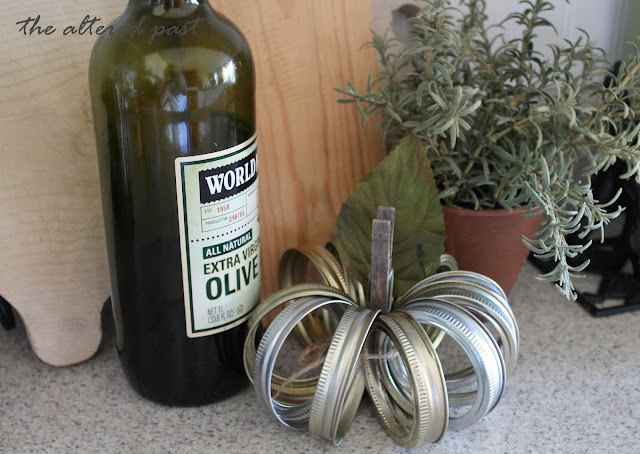 I tied mine together with a piece of twine and stuck an old clothespin and leaf in the center. That's it! By the way, see the potted rosemary behind it? It's fake! I found it at the thrift store about a year ago and I've had SO many people try to smell it or take a pinching from it. It's the best fake plant I've ever seen. Well, thanks for sticking with me to the end. I hope you found something that has inspired you. I know my inspiration comes from the many, many wonderful blogs out there. 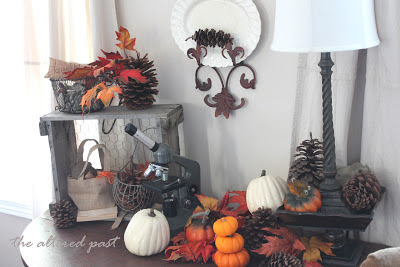 I'm finally able to get a few pictures of my fall decorations posted. Right now I'm doing good to get just the outdoor decorations posted. I hope to have the inside pictures posted soon. We'll start with the front door. The burlap bows around the porch lights were made from a burlap coffee bag that I had sitting around from last year. Our front door is black but I'm really toying with the idea of painting it a turquoise blue. A post on that later! Another view of the front porch with the pumpkins and mums on the steps. I know the flowers in the urn below the flag are a little puny. They're leftover from summer and were still blooming. I finally just turned my head and dumped them over the fence. 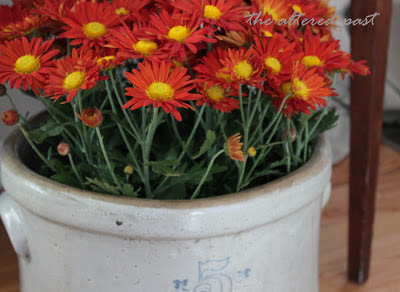 They've been replace recently with more mums. There's a story behind the little wheelbarrow in this next picture. We were at my in-laws this summer when my father-in-law, Emmett, mentioned that he had something for me. He went on to say that my husband had tried to talk him outing of getting it but decided to get it anyway. Emmett was right. I loved it. It was sitting, discarded by the side of the road. The inside was pretty rusty and he sanded it back to a nice finish. He left the outside as is...perfect! Since taking the pictures a couple of weeks ago, a few of my decorations have become MIA. Hmmm...I think I know how. His name is Cooper. He's our 1 1/2 year old Schneagle. That's a Miniature Schnauzer (his mom, our other dog) and a beagle. He obviously felt that I had left a bunch of balls out for his enjoyment. I have yet to find the big gourd. I found one of the smaller ones in the yard...in pieces. 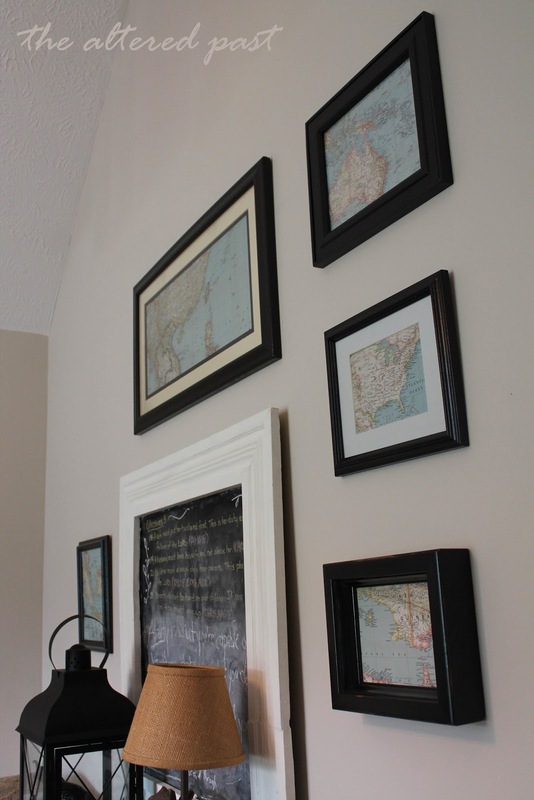 The last picture is a do-it-yourself project. Remember the corrugated metal flag I made for my shed? If not, you can find it here. I had a small square piece left over and decided to turn it into this. Sorry, I'm a bad blogger. I didn't have my camera with me as I was making it. It was really a very quick project. I drew a pumpkin shaped oval on the metal and included a stem at the top. Cut it out with tin snips...wearing gloves! Once it was cut, I used Krylon Pumpkin Orange (of course!) spray paint to color the pumpkin body. I sprayed it lightly in the center area giving it some depth. You can see it's darker around the edges. The stem is painted using Krylon Oil Rubbed Bronze. It was the closest thing I had on hand to a brown. The leaves were cut out of the last remnants of the corrugated metal and spray painted Krylon Ivy Leaf. All of the shadowing was done with the Oil Rubbed Bronze using a piece of cardboard cut in a curved shape and giving a light spray in one direction. That was it! Very easy project! Also, I found out that a piece of corrugated metal at my area Lowe's is less than $10 for an 8 ft. sheet. That could do a lot of pumpkins! I hope you enjoyed the few things I did get done outside. There's a whole lot more inside. 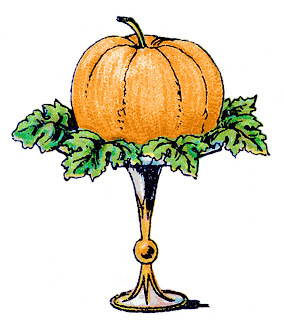 Check back soon to see ironstone, pumpkins, gourds, acorns, and leaves with lots of orange and turquoise yumminess. Thanks for spending some of your day with me. God bless! Blogger is fighting me today...grrr. I'm trying to change the header and tweak the blog view. Blogger is not cooperating. My profile has just disappeared. It says I'm already using the gadget but the gadget is not showing on the blog. 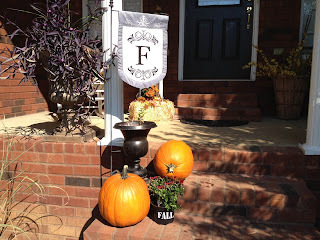 Hoping to get some fall decorations posted soon. Well, I told you I couldn't NOT go to Bella Rustica 2012. So, early (and I mean early 7ish) Saturday morning, I jumped in my car, dropped by my local Starbucks for a venti skinny mocha, and headed down the highway to the Bella Rustica Vintage Marketplace. It was about an hour and a half drive and I didn't really know how much of that included the back roads of Tennessee...or maybe I was just really excited to get there because I arrived pretty early...like 45 minutes early. Hey, I wasn't the only one. Actually, I was about the 6th car there, lol. I don't think the parking lot worker appreciated the early arrivals but I'm sure he got over it. So, here's what greeted me as I turned off of the small, two-lane highway. A beautiful farm hidden along the back roads of the Tennessee countryside in Pulaski, Tennessee. I've lived in Tennessee all of my forty (cough, cough) years and I never knew that the Mars Candy Company founder had owned a farm in middle Tennessee. Pretty cool. Ok, this next picture is a little cheesy because I'm one of those awkward people that sort of hang in the background till I'm sure of things. This is a picture of the entrance...taken from my car because I was too chicken to go stand in line with the two courageous ladies that said "Yes! We're the FIRST ones here!" Me? I'm in the car...making sure I'm not going to get in trouble for being where I shouldn't be before it opens. Must be from some traumatic experience of being where I shouldn't have been in kindergarten or something...or I'm just goofy. Anyhoo, isn't the barn beautiful? I l-o-v-e barns and a barn made of stone is just the best. Bella Rustica was held in the barn at Milky Way Farms. I didn't even get a chance to see the main house. That'll be a trip for another day. Inside this huge barn was booth after booth of vintage, chippy, shabby goodies. Just look at the metal letters and burlap curtains hanging from the ceiling in the main part of the barn. Now for a look at some of the booths. I'm sorry I don't have the vendor name with these pictures but you can check out the complete list of vendors here. Vintage cameras and alarm clocks and look at that globe! One of my favorite booths...I think I was really drawn to their cute vintage camper! Letters cut from old books! Ok, so what great things did I find there? Hang on to your hats and check out this next picture. I found Donna of Funky Junk Interiors!! Yep, pretty much one of the reasons I drove an hour and a half. I wanted to meet Donna. I've followed her blog for quite a while and I can now say, she's as sweet and funny in person as she is on her blog. Full of great ideas and has such a generous heart to share what she's learned. She led several workshops during the course of the 3-day event. I sat in on this one. She explained what the best tools are for the DIYers. If you're not familiar with her blog (and I can't imagine anyone reading mine wouldn't already know about Funky Junk Interiors), be sure to check it out here. I can't blog about Bella Rustica without mentioning that I also met Rhoda of Southern Hospitality. Ok, I admit it, I drove an hour and a half to meet them both! Approaching them, I felt like a creeper, lol. Having followed their blogs for so long, I felt I already knew them yet they didn't know me from Adam. Sadly, I didn't get a picture with Rhoda. I sat beside her during Donna's workshop. I hated to disrupt Donna's workshop but I had to at least speak to Rhoda because I knew I had to leave very soon. She was so sweet to say hi and chat a little about her house renovations and her parents. Love, love, love getting her emails announcing new updates to her house. If you love decorating, houses, and renovations, I'm sure you're familiar with HGTV's Sarah Richardson. 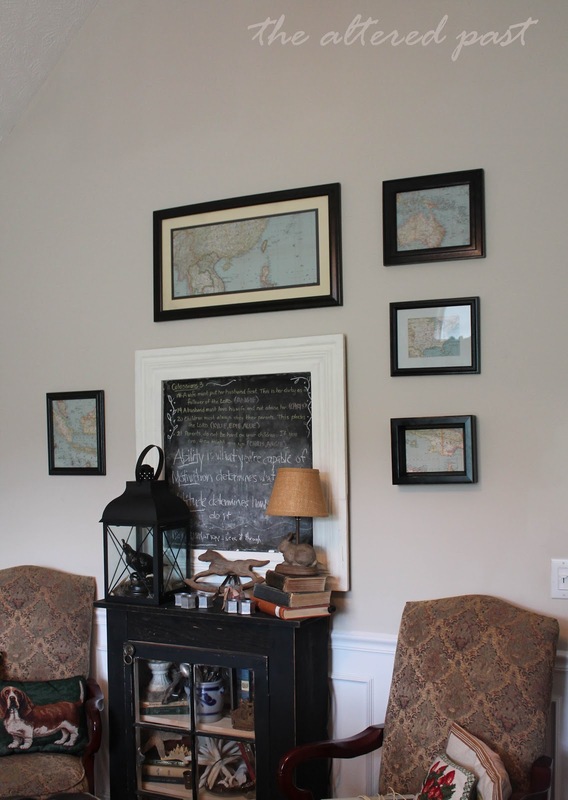 In this season's episodes, Sarah is taking a contractor grade house in a subdivision and showing us how to choose upgrades to make it beautiful. Well, she is making it beautiful but she's taking a $700,000 home and a $100,000 upgrade budget to do it. I don't know about where you live but here $700,000 would more than purchase a home that included all the upgrades I could ever want. I mention that to say, Rhoda's house renovations are beautiful and she's doing it on a budget I can relate to! You've got to check it out. Start here and follow it to the latest updates and you'll see what I mean. Rhoda's journey has been incredible and I can't wait to read the post that says "Move In Day!"